Find the export invoice form you need to complete your shipment. Download a free, printable PDF version and go to town. The commercial invoice is the one single document that describes the entire export transaction from start to finish. The basis for all other export documents, the commercial invoice is a bill for the goods from the seller to the buyer. It is also the primary shipping document used by customs worldwide for commodity control and valuation. 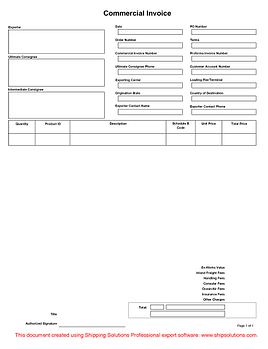 Proforma invoices are nothing more than quotations prepared to resemble commercial invoices. In fact, if the proforma invoice is correct, and if an order results, the final commercial invoice will closely resemble the proforma. Proforma invoice quotations are extremely handy when quoting Letter of Credit payment terms. The buyer can take the proforma invoice to his or her bank, which can then open a Letter of Credit that conforms to those terms. By making sure that details like sales terms, product descriptions and pricing are clear, costly changes can be avoided. 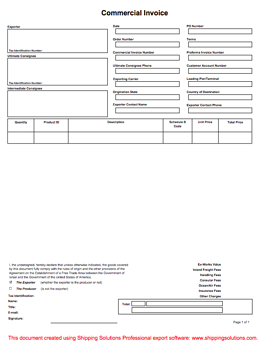 All proforma invoices should be valid for a specific period. Keep in mind that you are often quoting not only the cost of your product, but the transportation cost as well. A reasonable time should be allowed for the buyer to respond, after which the proforma invoice is no longer valid. Commercial shipments to Canada, regardless of mode of transport, which are valued at over $1,600 (Canadian funds), are not classified under HTUSA Chapter 9810, and are subject to duties and sales taxes, should be accompanied by a Canada Customs Invoice. The invoice must contain all the information currently required by Canada Customs Regulations and can be prepared either by the exporter/importer or their agents. 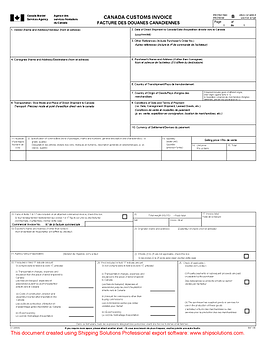 The Canada Customs Invoice must be completed to show (a) the transferor as the exporter; (b) the transferee as the purchaser; and (c) the original vendor as the vendor. The exporter must specify, in addition to providing the general data regarding the transacting parties, the conditions of the sale, the terms of payment and complete details relative to packing, description of goods, unit price and total prices. The Canada Customs Invoice must also document whether or not transportation and insurance charges, export packing and charges for construction or assembly in Canada are included in the selling price. Canada Customs is also very interested in whether or not commission or royalty payments are involved. In the Caribbean region, a free trade zone called the Caribbean Common Market exists. This free trade zone essentially creates one common market for the 13 member states. Theoretically, all goods produced within the common market can move freely throughout the common market and should not be subject to any import duties, license restrictions, quotas or other barriers to entry. With some exceptions, goods imported into the member countries from non-member countries are subject to import duties and other import restrictions. All exports to member countries from non-member countries must be accompanied by five copies of a properly completed CARICOM Invoice or a standard commercial invoice that includes all the data found on the CARICOM invoice. If the invoice is missing any of this information, the shipment may be delayed at customs. Prior to April 1, 2018, U.S. exporters who wished to qualify for preferential access to the Israeli market needed to use a special green certificate of origin form. That form has now been replaced by a U.S. Origin Invoice Declaration statement that needs to appear on a commercial document, which would typically be the commercial invoice. 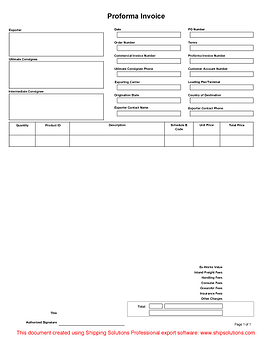 This version of the commercial invoice includes all the standard data elements that most exporters need to include for their export shipments in addition to the new U.S. Origin Invoice Declaration.